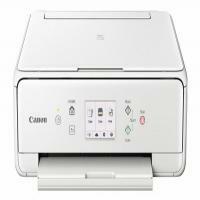 The Canon Pixma TS6051 printer, weighing 6.2Kg suits well with the white interior of your office space/ home. Pixma TS6051 is a multifunctionality printer that uses inkjet technology for high-definition printing. It also provides scanning and copying functionality into the same small and compact unit having 13.9 x 37.2 x 31.5 cm dimensions. Pixma TS6051 is compatible with MAC and Window OS. When compared to other printers, this printer is one level above than the other printers. As it provides a high printing speed for monochrome and coloured printing of about 15 ppm and 10 ppm respectively. Along with this, it supports multiple media types such as A4, A5, Letter, Envelope, square, rectangle (20 cm x 25 cm, 13 cm x 18 cm, and 10 cm x 15 cm). With the 6 individual Canon Pixma TS6051 ink cartridges, one can easily print beautiful photos with the vivid colours and sharp-text documents. Due to the availability of the separate ink tank, changing the expended colour cartridge is very easy and economical. The Pixma TS6051 printer has 3-inches LED Screen to make the navigation process easy and convenient. Moreover, to make the printing process flexible, it has a wireless connectivity option so that one can easily perform the printing job from anywhere. Apple AirPrint, Google Cloud Print and Canon PRINT are add-ons for trouble-free printing. The Canon PIXMA TS6051 is a versatile multi-functional printer, scanner, and photocopier, which enables to take on all the house publishing needs from a solitary compact, and a fashionable gadget. With the optional high-capacity XL Canon Pixma TS6051 ink cartridges one can easily save up to 30% of the cost per page. One can look for this money-valued printer for their home or small office printing jobs. How to replace the Canon Pixma TS6051 ink cartridges? When the remaining amount of ink in the cartridges cautions, an error message will appear on the touchscreen. In this situation, the printer will not able to print or scan. Take the appropriate action as stated below. Turn on the power while performing the operation. Open the scanning unit. The print head will move to the position for replacement. Caution: Make sure to not hold the print head holder to stop or move it forcibly. Do not touch the print head until it completely stops. Push the tab and lift the ink tank to remove the Canon Pixma TS6051 ink cartridges with the lamp flashing fast. Note: Remember to not remove two or more ink tanks at the same time. Replace the ink cartridges one by one when you are attempting to replace two or more ink tanks. Take a new ink tank out of its package, remove the orange tape completely, and then remove the protective film from it. Hold the ink tank with the orange protective cap pointing up while being careful not to block the Y-shape air hole. Lift up the tab on the orange protective cap to remove it off gently. You must insert the front end of the ink tank at a slanting position into the print head. Ensure that the position of the ink tank matches with the label. Press on the top of the Canon Pixma TS6051 ink cartridges until the ink tank snaps firmly into place. Make sure that the ink lamp lights up. You will not able to print if the cartridges are installed in an inaccurate position. Make sure to install them in the correct position as per the label on the print head holder. One cannot print unless all the required ink tanks are installed completely. Close the scanning unit. In order to close the scanning unit, hold it up once, then take it down gently. If a message is displayed on the screen, then select OK. While closing the scanning unit, be careful not to get your fingers caught. Q. What are the scanning specifications of Canon Pixma TS6051 printers? A. Canon Pixma TS6051 printers come with a CIS flatbed photo and document scanner with an optical scanning resolution of 1200 x 2400 dpi. It is capable of displaying greyscale as well as coloured scans. Q. Why is it that your compatible Canon Pixma TS6051 ink cartridges are more popular than original ink cartridges among heavy users? A. This is because we provide our customers with top quality ink cartridges that are way cheaper than the original cartridges. This enables users to reduce their operating costs without having to compromise on quality. All our compatible ink cartridges go through rigorous testing to provide users with durable and reliable ink cartridges for their printers. Q. An error code 1401 keeps getting displayed on my printer. What does this mean? A. This code indicates that your printhead may be damaged. You will need to contact your nearest service centre regarding this problem. Q. What should I do with an empty Canon Pixma TS6051 ink cartridge? A. It is important that we should not carelessly throw off empty ink cartridges as it is harmful to the environment to do so. Always dispose off empty ink cartridges according to the rules and regulations stated by the local authority. You can also drop off the empty cartridges in recycling plants. Q. Are the prices of the HP Envy 5642 e-All-in-One ink cartridges inclusive of delivery? How long would it take for the product to be delivered to me? A. We charge a small fee of €1.99 for doorstep delivery and courier of the product. The product will reach you within 1 - 3 days if you place an order before 12 noon. In case you require your order urgently, reach out to us on 048 30833221 and we will try to deliver the product to as fast as we can.